Even as someone who loves to read, I have to admit that words can often pale in comparison with the real experience. While stories can evoke emotions, experiences make lasting impressions and memories guide future actions. I have the opportunity to watch this play out in real time while working with REACH’s experiential partner, Driven[SM1] . 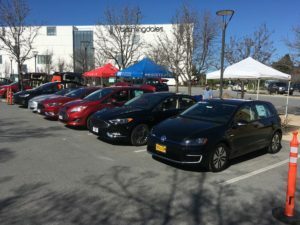 Recently, I was involved with the Electric Vehicle (EV) Ride and Drive events in Palo Alto, California, where we offered test drives of the latest plug-in electric vehicles. 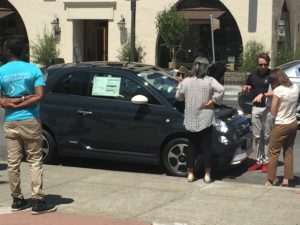 Through a California Energy Commission’s grant the City of Palo Alto provided funding for two electric vehicle ride and drive events as part of an initiative to drive EV adoption for cleaner energy and cleaner air. Events were held at City Hall and the Stanford Shopping Center. Overall, 109 test drives happened with vehicles from Ford, Chevrolet, Tesla, Nissan, Kia and Audi. Both of the events were no cost to attend, open to the public and strictly informational, so there’s no pressure to purchase or even discuss pricing. In total, the two events exposed an estimated 805 community members to plug-in electric cars. Test drive events are always fun for me because I have the chance to talk with a lot of different people (which I love! ), and I get to check out the cars. I wouldn’t consider myself a car enthusiast– I pretty much stick with the sound system, color, and amount of cup holders as key criteria. Learning more about electric vehicle technology, though, has me hooked. Seeing vehicles that are not only comfortable and stylish, but also able to reduce our dependency on oil, is exciting. And a heated steering wheel?! Sign me up! Both of the Palo Alto ride and drives provided the majority of participants with their first time ever behind the wheel of an electric vehicle. The transformation that takes place after a test drive is really remarkable, and it reminds me of my own initial skepticism. People are initially concerned about how the car is going to drive. We’re all used to finding solace in hearing an engine run, so the car’s silence tricks our brains into temporarily believing an EV is lesser-than. While people may have read stories about EVs, test drives give them experiences with which to combat their initial opinions. When I ask people how the drive went, they usually exclaim, “That was fun!” and then go on to list their reasons for liking the experience. Many people say “it’s so quiet,” before their test drive, using it as a negative for the car. That same sentence turns to a positive after the test drive, and they realize how nice it is to have some quiet. At the City Hall event, 71% of drivers reported that their overall opinion of an EV was better than before, while 83% of Stanford Shopping Center participants said the same. Hearing positive feedback from the events is always a good feeling. Changing perceptions and driving people to action takes time, though. That’s why these events continue to happen. And at every event, one of us from REACH will be there, eager to see the transformations in action.